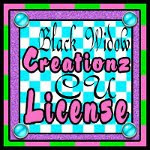 For this tag, you'll want the PTU tagger size kit called Flurry of Fun by Creative Scraps by Crys. I got it at Mystical Scraps. You can purchase it HERE. Tube of Choice.... I'm using the PTU tube called Frostie by Creative Tubes by Crys HERE. You need to have a license granted to you in order to use this tube. Grab the FTU mask #435 by Vix HERE! Grab the FTU mask #36 by Rachel HERE! I use Gimp 2.8 but you can use any version or convert this tutorial pretty easily to your digital editing program of choice. 2. Using the rectangle select, place a rectangle in the frame as shown in screenshot below. Move Paper 10 over and while it's selected in layers box, go to LAYER>CROP TO SELECTION then SELECT>NONE. Add a drop shadow to the frame by going to FILTERS>LIGHT&SHADOW>DROP SHADOW with settings at 2/2/15 (as shown in screenshot below). 3. Drag and drop the tube of choice in. Do not forget to add the correct copyright information. Artist's name, website and license number, when applicable should be clearly visible. Right click on tube in layers box and choose SCALE LAYER, 351x737. Add drop shadow as you did in prior step with same settings to the tube. Merge tube with shadow by R clicking MERGE DOWN. Next, R click on the frame and choose MERGE DOWN with shadow and once again, MERGE DOWN with Paper 10. Duplicate this layer by clicking the icon in the layers box as shown in screenshot below. Then go over to your toolbox and click on the Flip Tool once and then click on the frame duplicate within the canvas. Move one to right side, and move tube in between. R click, MERGE DOWN frames together. 5. Drag and drop another Paper 10 into the canvas then drag it down to the bottom of the layers box (R click-ADD ALPHA CHANNEL). Drag and drop Vix_Mask435 & RR_MaskSet36_Mask3 into the canvas. Scale Rachel's mask to 495x495 then place on left bottom side of tag. Go to COLORS>INVERT then LAYER>TRANSPARENCY>COLOR TO ALPHA. Do this to both mask layers. Your layers box will look like the screenshot below. Duplicate and flip the copy of Vix's mask, place each on the top sides of tag then merge two mask layers together. R click, ALPHA TO SELECTION then click on Paper 8 in layers box to activate that layer and go to SELECT>INVERT and EDIT>CLEAR. Your paper 8 is now a duplicate of the mask. See that in the screenshot right above? With the original mask, go to COLORS>INVERT to make it white. Place the white at top back and paper mask in the middle back of the tag. Do the same thing with Rachel's mask, duplicate, flip, arrange, merge, ALPHA TO SELECTION, SELECT>INVERT and EDIT>CLEAR. Click on the little eye next to the original mask layer to make it an invisible layer, or delete. 6. Crop your tag, Right click on your Background layer in layers box and ALPHA TO SELECTION, go to IMAGE>CROP TO SELECTION. Then delete the Background layer. 8. Save your tag as .xcf first so you can go back in and make layer by layer alterations if the need arises. Then when you're happy save as .png and you're done! Woohoo. Awesome tag there. Here's a FREEBIE Facebook Cover that I made with the same kit as the tutorial, Flurry of Fun by Creative Scraps by Crys. You're welcome to use it! Just do not change or add to it, and do not claim it as your own!